Looking forward to watching the Masters this year? For four days each April, the world of golf is riveted watching the sport’s greatest athletes compete in the most exclusive tournament. The Masters began over 80 years ago, and though much has certainly changed across the sport and the globe, this is a tournament that remains as true to its roots as it possibly can. History is of utmost importance at the Masters. So that you can fully appreciate the significance of this tournament and its many traditions, here is a detailed history of the Masters Golf Tournament, from founding to present day. The Masters is one of four major championships in international golf. It is the first tournament of the year, it is also the only tournament in the circuit that is held at the same location every year: the Augusta National Golf Club in Augusta, Georgia. The tournament lasts four days, but also includes three days of pre-tournament programming. 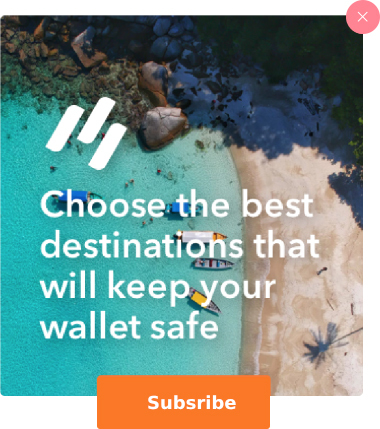 In 2018, the purse is a whopping $11 million. The man who founded the Masters, Bobby Jones, had been in retirement for over 3 years, and he decided to make his comeback at his new golf course he had crafted at Fruitland Nurseries. He built the course in about two years, and thus one of the four major championships was born. Construction on Augusta began in 1931, when Jones and his co-founder Clifford Roberts bought the Fruitland property in Augusta, Georgia for the price of $70,000. Dr. Alister Mackenzie was chosen to help put together the design for this illustrious golf course, who worked with Jones’ vision but also scrapped some of his wilder ideas, such as an obstacle-like 19th hole. Once the course was put together, the first Masters was ready to be held. 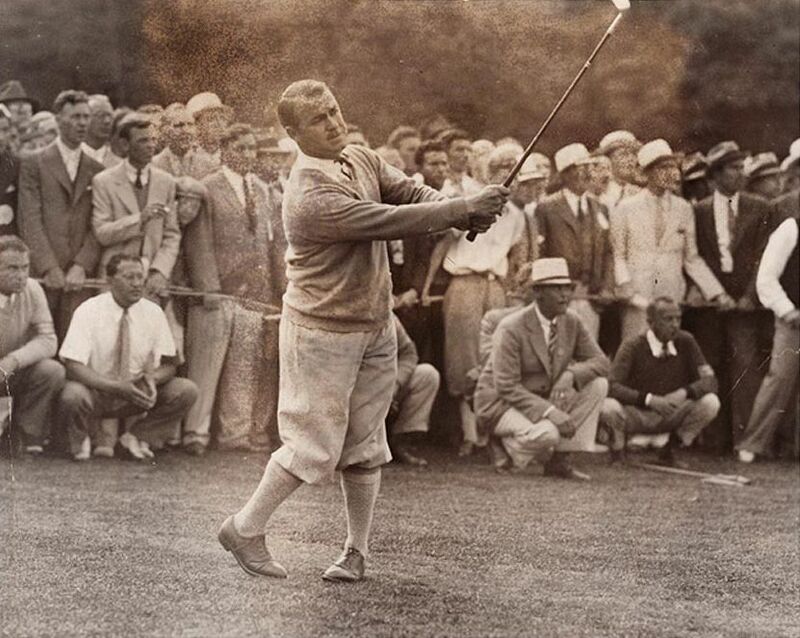 Bobby Jones circa 1921, twelve years before the founding of the Augusta National. When Was the First Masters Golf Tournament Played? On March 22, 1934, the first shot was taken at the brand new Augusta National Golf Club. The first winner of the tournament was Horton Smith, who beat out Craig Wood by one stroke to win the $1,500 final prize. The tournament was originally called the Augusta National Invitation Tournament, and was later changed to the Masters in 1939. One of the most iconic moments in golf history occurred on the par-5 15th hole at Augusta in 1935. Gene Sarazen hit a coveted double eagle shot to get back into a tie for the lead, and would later go on to win the Masters that year. This shot put the Masters in the forefront of the golfing world, and came to be called “the shot heard ‘round the world”. Unbeknownst to most, that 15th hole was originally the 6th hole when the gold course was built. This meant that what was originally the front nine became the back nine. There were a few good reasons for this change, including several bodies of water surrounding the 15th and 16th greens that give the course an exciting finish. It is hard to imagine what might have been if Sarazen did not have the opportunity to hit his double eagle on the back half of the course. 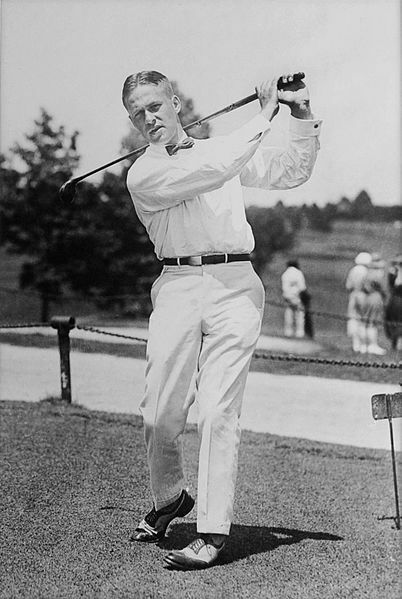 In 1936, Horton Smith became the first two time winner of the Masters by edging out Craig Wood once again by one stroke. 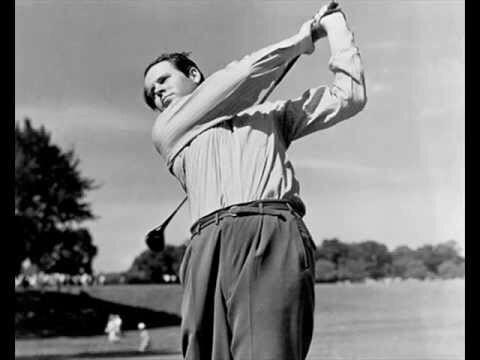 A year later, in 1937, Byron Nelson added his own piece to Masters history by making a 6 stroke comeback on Ralph Guldahl in the final round. Guldahl would get his turn later on in 1939, when he shot 3 under on the back 9 to win by a stroke. This was the year the tournament was officially named the Masters. Ralph Guldahl was known for his relaxed playing style, always pausing to comb his hair before every hole. World War II paused the tournament for a span of 3 years, and the Augusta National green was actually used to raise cattle and turkey for the war efforts. When the war was over and the green had been repaired, the Masters came back with the same lore and appeal as before. In 1950, Jimmy Demaret became the first 3 time Masters winner by beating out Jim Ferrier. Two years later, Dwight Eisenhower was elected president, and the members at Augusta National built Ike’s Cabin in 1953 near the tee on the 10th hole. 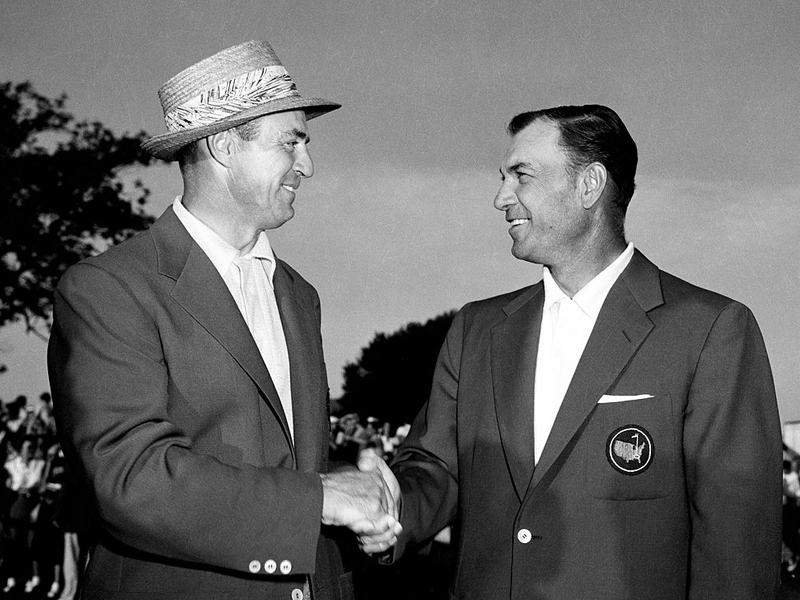 The next year, Sam Snead locked up his third and final Masters win the 1954 tournament over Ben Hogan in a playoff round. The first TV broadcast of the Masters followed two years later, televising Jack Burke Jr.’s 1956 victory Ken Venturi after trailing by 8 strokes. In 1958, golf writer Herbert Warren Wind used the term “Amen Corner” to describe holes 11, 12, and 13, and the name stuck. Arnold Palmer also took his first Masters victory, winning a purse that had risen by then to $11,250. The charming and eccentric Palmer would do much for the sport’s public image, as well as for the Master’s tournament. In 1960, the first par-3 contest was held at Augusta. Sam Snead won the event on the specially designed short course. In the same year, Arnold Palmer won his second Masters by birdying the last two holes. With the purse now reaching $20,000, South African Gary Player became the first foreign player to win the Masters in 1961. This win set off a series of unique first timers and records. Two years later, Jack Nicklaus became the youngest player to win the Masters at the age of 23 in the year 1963. The next year, Palmer was the first player to win the Masters 4 times. Nicklaus bounced back in 1965 by setting the new course record for a 72-hole performance. He would follow that up with another victory in 1966 to become the first back-to-back champion. 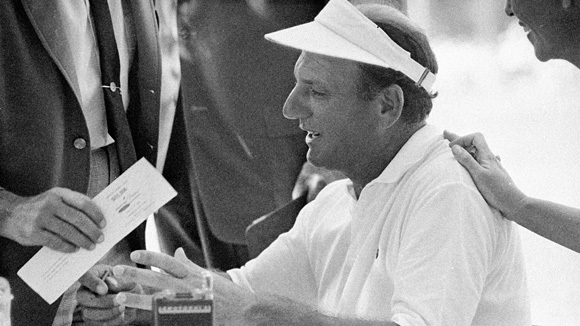 Among the most frustrating losses in the history of the sport was Roberto De Vicenzo’s disastrous blunder in 1968. He signed an incorrect scorecard and thus crowned would-be runner-up Bob Goalby the champion. Roberto di Vicenzo graciously accepts his mistake and the loss that comes with it. During the ’70s, founders Bobby Jones and Clifford Roberts passed away and were met with adoration from golf fans at their memorials. In 1975, Jack Nicklaus earned his 5th green jacket, a Masters record. He went on to win a 6th jacket in 1986, becoming the oldest golfer to grab the title. On a day that had spectators on the edge of their seats, the first sudden-death playoff was won by Fuzzy Zoeller in 1979. Up until this point, the playoff was another 18 or 36 holes of golf the next day. 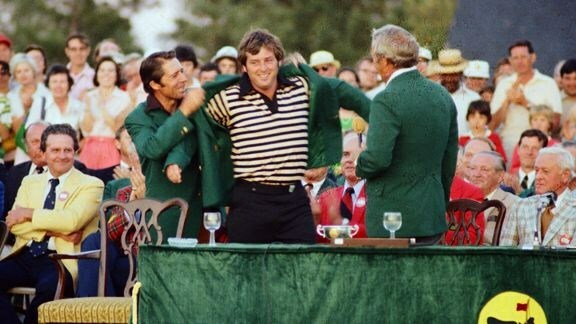 Fuzzy Zoeller accepts his green jacket in 1979. The first Masters victory by a European was achieved by Spaniard Seve Ballesteros in 1980, and 4 more were soon to come. Englishman Nick Faldo won back-to-back Masters in ’89 and ’90, and the purse was then at $225,000. Over the next few years, stars like Woosnam, Couples, Langer, and Olazabal walked away victorious. Ben Crenshaw and Nick Faldo took the jackets in ‘95 and ‘96, and then began a new era of golf. 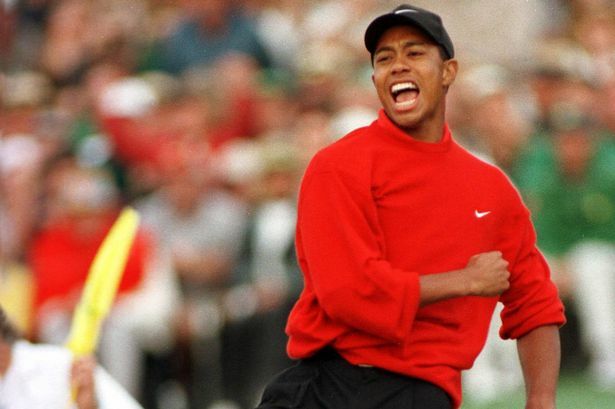 1997 was the year Tiger Woods burst onto the scene. He was the youngest player to win, as well as the first non-white player, and he crushed the competition by shooting a course record 18 under par. Woods 18-under-par victory is still a Masters record, though Jordan Spieth matched it in 2015. At the beginning of the new millenium, the Masters became the first golf tournament to be broadcasted live on network television with HDTV. Vijay Singh won the Masters in 2000, followed by two consecutive wins by Tiger. This made Tiger the first golfer to hold all 4 major championship titles during the same year in 2001. He also became only the 3rd golfer in Masters history to win back-to-back titles. His closet was beginning to fill with green. Weir and Mickelson took the next two titles, followed by Tiger’s 4th green jacket. The purse had now rose to $1.26 million. Mickelson took another win in 2006, followed by Zach Johnson and then Trevor Immelman. Angel Cabrera would win the Masters in 2009 in a two-hole sudden death playoff. 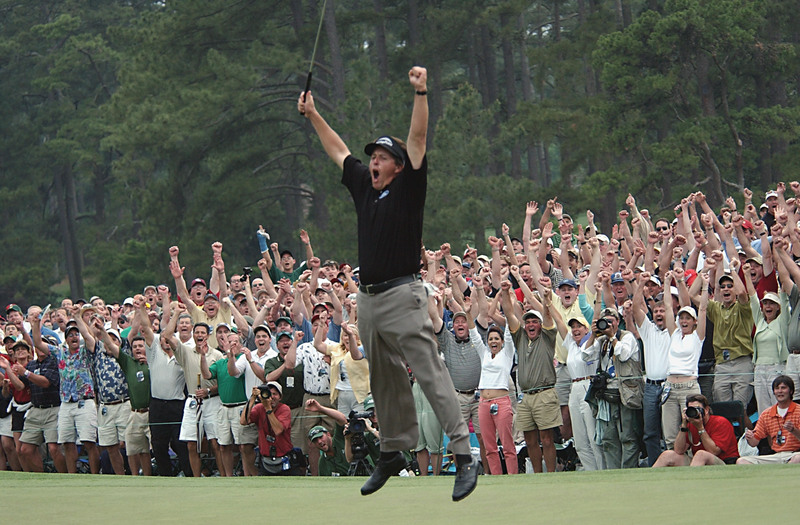 In 2010, Mickelson captured a resounding 3rd green jacket by shooting 16-under-par. The following year Charl Schwartzel takes the Masters by surprise by becoming the first golfer to birdy the last 4 consecutive holes on his way to victory. Despite Louis Oosthuizen sinking a double eagle to make a playoff with Bubba Watson in 2012, Watson was able to capture his first major victory with a spectacular hook shot from the trees. Adam Scott became the first Australian victor the following year. In 2015, Jordan Speith tied Wood’s record of 18-under-par and won his first green jacket. Speith had an opportunity to repeat the following year, but Danny Willet was able to capitalize on Jordan’s back nine mistakes and win the green jacket. 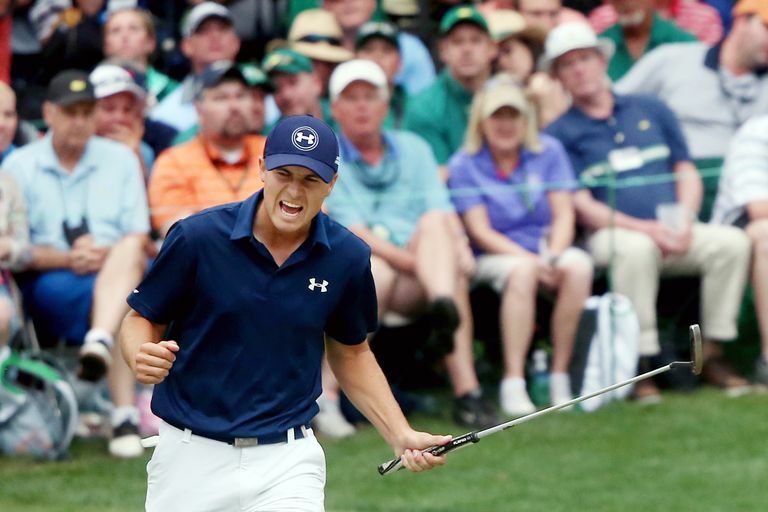 Jordan Spieth celebrates a par-saving final putt for the 16th hole in 2015. Last year’s Masters was as exciting as any, as Sergio Garcia edged out Justin Rose to win the 81st Masters tournament. What will the 2018 Masters have in store for us? 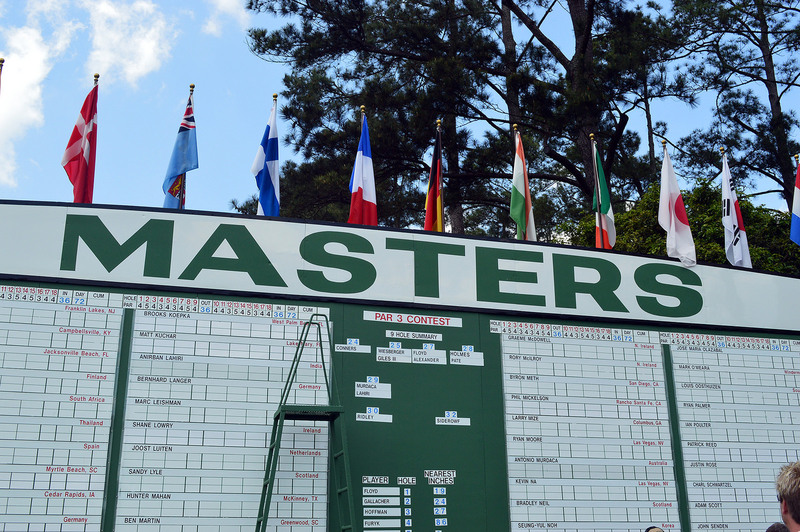 Now that you know the Masters history, you need to see the action for yourself. 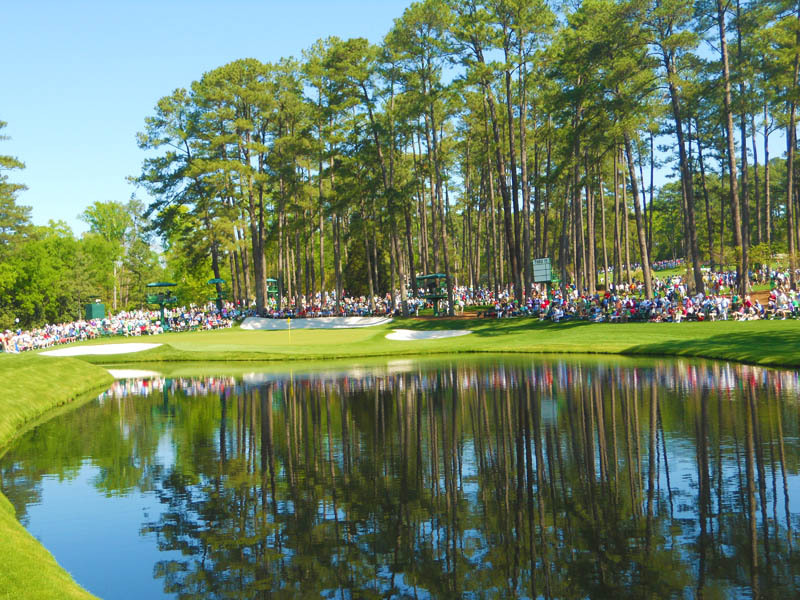 Explore our Masters Tournament Packages for an exclusive trip to this prestigious tournament. 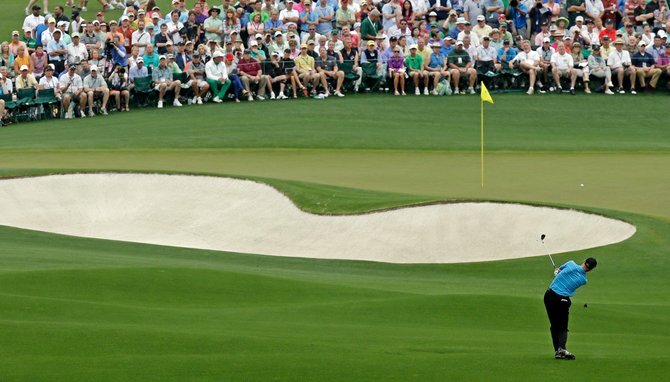 The Masters is a tournament like no other that all serious golf fans should experience first hand.